EMFs (Electromagnetic fields) are a highly complex subject which can be difficult to understand, especially given the level of jargon used. We hope to explain some of the basics here, including references to further information where appropriate. An EMF (which stands for "Electromagnetic Field") is a field of energy created by electrically charged objects. An electromagnetic field has two "components", a magnetic component and an electric component. The electric field is produced by stationary charges, and the magnetic field by moving charges (currents). Electromagnetic fields are also often referred to as "Electromagnetic Radiation" (EMR). 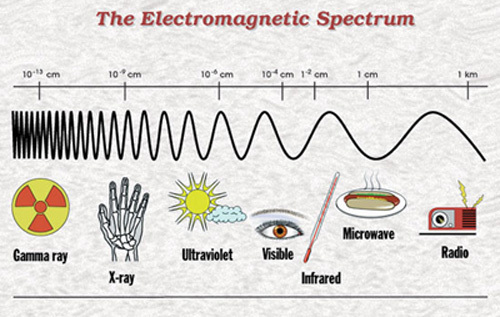 You can't see, feel or hear electromagnetic fields, apart from visible light, which is a part of the electromagnetic spectrum. For visual explanation, NASA have a simple but useful diagram, and there is a far more detailed diagram available from Thinkgeek (purchase required). For a more in-depth analysis, please read our article "To pulse or not to pulse". We have evolved with the natural levels of EMFs produced by both the sun and world around us. Background levels of EMFs vary hugely depending on which part of the spectrum being looked for - natural light is an obvious example. The earth's magnetic fields are static fields, unlike man-made alternating current (AC), which has no natural counterpart. Microwave frequency exposure is a relatively new phenomenon: 100 years ago the background radiation was millions of times lower than it is now, and it is as recent as the mobile phone boom (~1990's) that the modern, digitally pulsed signals have become ubiquitous in the Western world. Power frequency (50Hz in the UK) is given off by any appliance or transmission of AC (alternating current) electrity. Electrical wiring creates electric and magnetic powerfrequency fields throughout houses and other wired buildings, but these levels are usually very low unless there is a wiring fault. Many standard household goods will leak power-frequency EMFs due to poor design. Absolute proof of whether something is safe or unsafe is not possible to establish. Most areas of science can only deal in probabilities, and that becomes clearer as more scientific studies investigating health effects are produced. Unfortunately the studies are not always well done, and the flaws in any given study (showing an effect or otherwise) are often not reported. Childhood leukaemia has been internationally accepted as linked to powerfrequency exposure magnetic fields, with a wealth of literature finding increases in risk to this and other illnesses. There is more disagreement about ill health effects from radiofrequency radiation, which is newer for most of the population, though a well-established 'microwave sickness' has been described. Precautionary levels which will protect us from illness have not been agreed on, as some countries wish the levels to be lower than others. It is well documented and generally accepted that over-exposure to ultraviolet rays can cause burning and skin cancer. As a result fortunes are spent on protective sun cream and information services as to prudent avoidance of such exposures. The "Radiofrequency EMFs and health risks" article in the Powerwatch article library has a detailed and up-to-date overview of the existing science on microwave frequency EMFs and their effects on health. Microwave ovens work on another well documented and understood principle. Molecules in the food are vibrated by high levels of microwave frequency Electromagnetic energy, causing it to heat up and subsequently cook. If you stood in front of an operational microwave with no door your insides would slowly be cooked. Because of this, microwave ovens are stringently designed against leaks, and opening the door operates a safety mechanism which disables the oven, thus removing the risk to the operator. There are internationally accepted guidelines by the International Commission for Non-Ionising Radiation Protection (ICNIRP) that have been designed to limit both residential and occupational exposure to levels that are safely below those that can heat up tissue. Currently these guidelines are between 28 and 61 volts per metre (V/m) depending on frequency. However, recently there has been a number of studies showing very specific biological effects far lower than these levels (see our Studies list), and as yet there is no international guidance that has taken any of these studies into effect. This, coupled with misleading statements designed to imply that there is currently no published evidence showing a link from organisations such as WHO, are the primary reasons why this topic remains in such hotly-disputed contention. In contrast to the exposure guidelines levels set by ICNIRP, health effects are being reported as low as 0.06 V/m. Powerfrequency electromagnetic fields are generated by any appliance running off AC (alternating current) power - anything plugged into a main power socket will generate them to some degree. ICNIRP have set guidelines for residential and occupational exposure to powerfrequency magnetic fields, based primarily on electric shock responses and induced currents, currently set at 100 microtesla (µT) - equivalent to 1 Gauss. At the moment, health effects primarily associated with powerfrequency EMFs are due to the magnetic component - these include, but are not limited to, Childhood Leukaemia, Adult Leukaemia, Amyotrophic Lateral Sclerosis, Miscarriage, and Clinical Depression. The evidence on these is mixed, but the link with Childhood Leukaemia is now considered to be pretty solid, with a doubling in risk at magnetic fields above 0.4 µT (again far below the guidelines set by ICNIRP). There is a fairly brief overview of health risks and evidence in the health concerns section of the electric power transmission article on Wikipedia. This research and considerably more is covered in greater depth in the "Power Frequency EMFs and health risks" article in the Powerwatch article library.